Image: Pacific Partnership 2011 website. HONOLULU (NNS) — Pacific Partnership Leaders met with Oceania subject matter experts at the East-West center in Honolulu, Hawaii to discuss how to better serve humanitarian interests in the region, April 1. 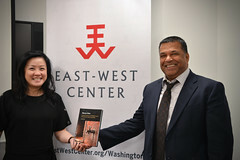 The East-West Center has been serving for 50 years as a U.S.- based institution for public diplomacy in the Asia-Pacific region. 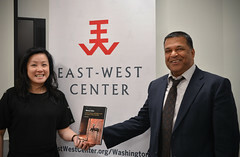 “The East-West Center promotes better relations and understanding among the people and nations of the U.S., Asia, and the Pacific through cooperative study, research, and dialogue,” said Gene Vricella, scholarship program coordinator for the East-West Center. This is the first time Pacific Partnership leaders have met with subject matter experts at the East-West Center since the Pacific Partnership missions began in 2006. “It is imperative that we approach these missions with the best possible information about the cultures and customs of the people we have as partners. That’s why we decided to utilize the knowledge and expertise of the students and staff at the East-West center,” said Capt. Jesse A. Wilson, Pacific Partnership 2011 mission commander. Among the topics of discussion were the region’s most pressing issues. “The region faces a lot of challenges such as agriculture, engineering, medical, dental and environmental protection,” said Vricella. 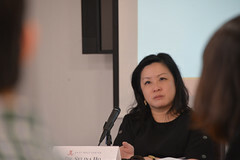 “Poverty and all sorts of problems associated with poverty is the main issue in the region. Problems such as healthcare, littering, and water quality are also major issues,” said Dr. Chris Lundry, assistant research professor at Arizona State University. These are some of the issues the Pacific Partnership team will help their partners tackle when amphibious transport dock ship USS Cleveland (LPD 7) arrives with the main body of the team. Cleveland is the lead U.S lead Vessel for the five-month deployment. The ship will visit Tonga, Vanuatu, Papua-New Guinea, Timor Leste and the Federated States of Micronesia. The Pacific Partnership team will work together with partner nations and host nations to provide medical, dental, and engineering projects to host countries. The team will also help develop clean water practices, alternative energy initiatives, and methods of recycling. “As Pacific partnership 2011 strengthens relationships and builds new ones, this mission demonstrates U.S. commitment to the Pacific region,” said Wilson. Gene Vricella provided a list of other EWC staff in attendance, as well as a number of EWC students representing some of the countries targeted for this mission (Papua New Guinea, Timor-Leste, and Vanuatu). This entry was posted in Major Issues in the Region and tagged Pacific Partnership, Pacific Partnership 2011. Bookmark the permalink.